This morning I woke up and turned on the light. Well, I went to turn on the light, but nothing happened. I wondered if a breaker had hit threshold and turned off the circuit in my bedroom. Then I saw the whole house was dead and all of the circuits in my circuit breaker were lined up in the “on” position. I looked beyond my own little bubble and sure enough, no neighbors had any lights on either. What is perfect about this is, today I had planned to have a “Tech-free Tuesday” and now even mother nature was supporting my decision. I set off to a local coffee-house on foot so I could get some Earl Grey tea and a scone and so I could enjoy their space for writing, something I had been meaning to do for way too long. As I walked, I noticed no lights for several blocks. I saw a school with the rooms dark and houses at dusk without any lights. It ended up the coffee-house was also in the dark and without a cash register, no sales were happening. A few folks sat in the dark and discussed the power outage. I at least knew, I was not alone and I found comfort in that fact. 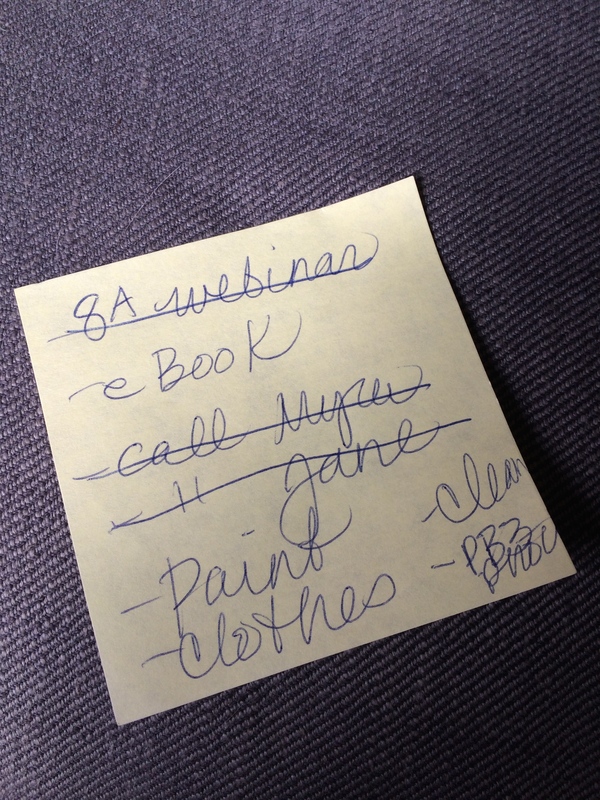 I used my hand scratched list on a post-it that really needed to be twice as big to outline my goals for the day. Goals that were mostly tech-free with the one exception, I am allowing myself to be part of a webinar for bloggers and to write today. Without wi-fi I had to join the webinar via conference call, this gave me the solid focus of listening, versus multi-tasking on the web while listening. It also blunted me from participating or having any interaction on the webinar however. My goal to paint was postponed as without electricity I may not be able to see clearly due to our gray skies. Even my goal to clean was slightly narrowed to cleaning by hand (versus machine) and to areas where full light was not essential. Making calls became an easy focus as my phone still worked. It felt good to talk versus email or text for a change. Why don’t I do this more often? There is something calming and focusing to not having electricity. My creativity and problem-solving skills got a boost, as what I could do, or not do shifted. I felt more grounded and connected by reaching out to real people for information about the black-out and by calling friends and family versus emailing or texting. I was more productive without Facebook, without checking email and without doing random web searches for answers to questions that pop into my head. I actually was a bit bummed when the electricity came back on. But, now I know that I can shift my environment to support new ways of interacting in my world…even if that means I need to shut my circuit breaker off (literally or figuratively). Does it take a black-out to get us to un-plug? What are other ways you un-plug? If you enjoyed this blog and would like to be notified when future blogs come out, please “follow” me via my homepage. Your email is never shared and I promise not to try to sell you anything. I’ve done Tech-free Tuesdays in the past and found them a bit hard, but very special. Time to schedule another one soon!